Michael Robertson has a long history of pushing the boundaries of copyright law, by going where the technology allows, even if the law hasn't quite caught up yet. As such, he frequently finds himself on the wrong end of legal actions from legacy players who hate being disrupted. 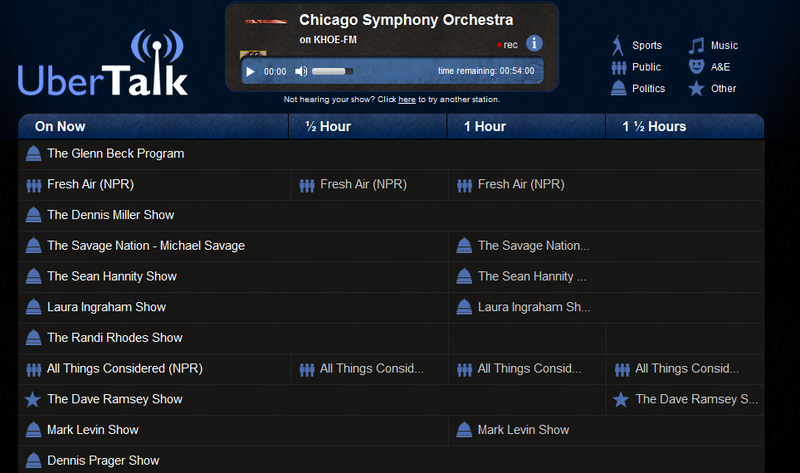 Last year, we wrote about his DAR.fm effort, which basically is an online DVR for broadcast radio. He's now taking that even further, with the launch of UberTalk, an online directory of what's on radio right now (and in the future). You know your basic online (or on screen) TV guides? Yeah, UberTalk is that, but for radio -- with the convenient ability to play... or to record and time shift anything you'd like. Given the state of radio today, this seems really, really useful. But, is it legal? We've already seen legal threats pointed at DAR.fm, and I can't imagine that all the broadcast folks will like this either -- even though it only increases the value of their product by making it more easy to find and useful. What we're seeing, yet again, is how the technology allows for something really useful that adds value to both the content and for the users. And yet... copyright law makes it very, very difficult to pull off. Why? Because copyright law is purposely built around keeping the status quo, not about encouraging innovation. So you have yet another clear case where it seems like copyright law is holding back "the progress" rather than helping to speed it along.